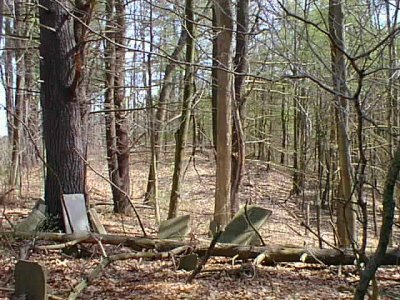 The Greatsinger Cemetery is located in the extreme eastern part of the Town of Elmira, Chemung County, New York. Situated on the Greatsinger Road, the site of the burial ground is indicated by a stand of towering pine trees on a rise of ground on the north side of the dirt highway, three tenths of a mile off County Road #1, (Jerusalem Hill Road). The latter highway originates at East Water Street, Elmira, and winds to a junction with County Road #2, then curves north to North Chemung. The Greatsinger Road twists eastward off County Road #1, about 200 feet north of the intersection of that highway and County Road # 2. The Cemetery is on a tree covered ridge which is heavily carpeted with brown pine needles, dead leaves and patches of myrtle, a lack of sunlight discouraging undergrowth. The boundaries are irregular and not readily apparent. In some places old paths can be seen winding around the ridge. There is no evidence of a main entrance. The graves closest to the highway are some 150 feet distant. In some areas the graves are located close together, with the remainder being scattered. There are many sunken sites minus grave markers, and numerous bases with no headstones. A good fifty percent of the memorials are on the ground, making it necessary to dig into pine needles and soil to uncover them. Almost all of the tombstones hod to be covered with white chalk to bring out the eroded data for accurate reading and recording. The following list of existing markers was made by Isabel Ridall and Doris and Joseph Boyd on May 1, 1975. In some cases, such as wife, son or daughter, the surname has been added for clarity. Any data in ( ) does not appear on the headstone, but has been added for interest. Stones read in 1932, but not found in 1975 are so indicated. 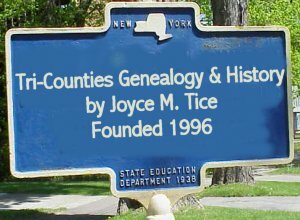 Also interments recorded in Elmira City records, for which no stones were found, are noted. Edwards Asa L. 1830 1902 Co., I, 141st Regt., NY Vol. Stannard Mercy R. 1852 1874 Daughter of Giles & Lydia Stannard "Erected by her brother"